Hello, Noshers! Wow, this week was just crazy jam-packed. I literally was busy without a moment to spare from morning until night! I also have a busy weekend ahead but look forward to catching up on Sunday afternoon. After all, I have to share with all of you my write-up of the Autism Speaks Annual Celebrity Chef Gala I attended on Tuesday – what a great event and for a great cause! I will also be attending some portions of the New York Wine & Food Festival – delicious times! (See last year’s write-up here). Today’s fun fact is, in my opinion, even better than last week’s fun fact – and that one was pretty good! 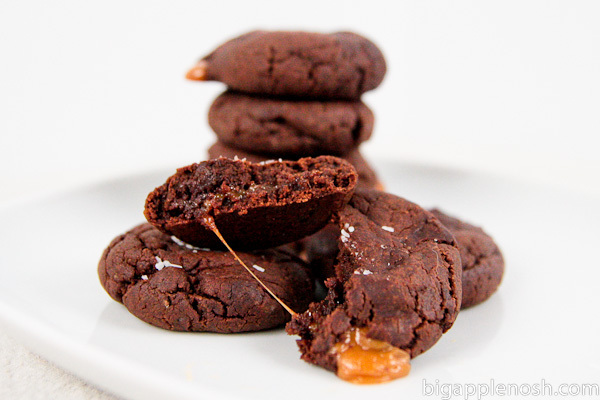 Chocolate Caramel Cookies with Sea Salt, anyone? October is National Dessert Month. Ok, Noshers!! Name your favorite dessert! Let’s see what dessert reigns supreme amongst all of you! for this time of year, anything with pumpkin or apples in it! ooh those cookies!